On Sunday, I didn’t want to go to church. Confession: I rarely want to go to church. I want a day of peace (ironic, no?). A day of rest. A day of lounging on my front porch until late morning, drinking in my coffee and the sun’s rising, morning bird singing, Wendell Berry’s Sabbath Poetry and easy conversation with my husband. I haven’t always had such disdain for Sunday morning service. Church was where my friends were. Church was where the Word was opened fresh and palpable and by a “live” person, not on jumbo screens. Church was in a red brick building with a steeple pointing upward, and heavy wooden doors painted red and open wide allowing several people to walk through at once. Church was warm light streaming in from high windows, worn red carpet under my feet, and the smell of wood and plaster and saints. Church reminded me of heaven. But now church reminds me of a rock concert or a motivational speaking convention. Church has become an experience, not a fellowship. Fellowship happens outside Sunday morning – at least that is our church’s way. We are a “small group” church. Sundays are for saving. So, I didn’t want to go to church. But we went, because we had no reason to stay home and unlike me, Superman remains less jaded – or just less affected by his surroundings when he worships. Of course, once there I opened to it; smiling back at friendly faces, surprised by remembering how happy I am for the freedom to worship as I believe out in the open and even in a public school; glad that dropping off my children to their Sunday School class is easier than it was years ago, when I loved going to church but my young boys hated being left in the nursery and often I would be called to come fetch the baby (even when he wasn’t) who refused to be consoled. I have participated in communion since I was thirteen years old – a freshly confirmed Lutheran wearing a white robe covering my new purple and green pastel flowered dress with lace trim on the wide, shawl-like sleeves. Since that time, I have broken bread, wafers, and crackers; drank from silver and from plastic; kneeled at an altar, stood in line, and dined in a gymnasium from a metal folding chair. I have supped on the actual body and blood of our Lord, and I have taken the representation. I have taken communion when I thought it only another ritual and while standing in a vision of eternity. It was something my pastor said. He reminded us that when we partake in communion we unite with all believers all over the world. There was more, but I don’t remember it because my mind filled with the faces of saints – every color and every flavor. I saw the faithful at the Lutheran church where I grew and learned the Apostles and Nicene Creeds, memorized parts of the Psalms without realizing it, noticed how sunlight streams into stained glass and how pipe organs can fill every square inch of a vaulted room with its wind made into music – even into my soul. On Sunday morning, we broke bread together – in remembrance of Him. 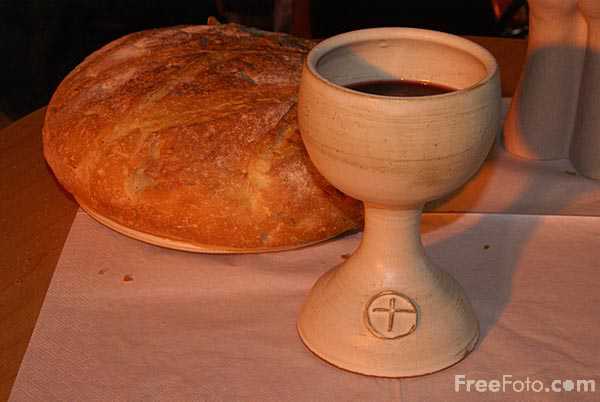 Communion – a beautiful word by its own right; beginning strong yet inviting one into its richness with the smooth consonants and vowel blends filling its three syllables. Couple the word with its meaning and there is eternity here on earth. I am so glad we went to church on Sunday. Oh I love it… I got goose bumps at the end when you talked about how your mind filled with the faces of the saints, every colour and flavour. I love that so much; it reminds me of the vast length and breadth of the beautiful Body of Christ, which stretches across time and space, every generation and every nation. And that’s what it’s all about, isn’t it. Church – the Beloved of Christ, regardless of her pale, stale, frailties and her obvious lacks and losses and licentiousness… oh, how He loves her…and how deeply we must love her too.